Tape to digital: precious memories brought to life in a modern world! 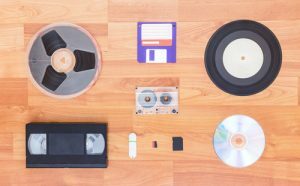 Many individuals and organisations have truly great materials currently locked away in analogue (tape) formats such as VHS, Betamax, cassette, reel-to-reel, cine, video and floppy disks. Now you can bring them to life and enjoy them in modern, digital format. Scan Film or Store can convert your audio and visual material into DVD, CD, external hard drive or USB format. Or a combination: you choose. We can also duplicate digital copies so you can share them around. Unlike tape-based recordings, digital transfers do not snap, tangle, unravel or lose quality – and they never fade. What’s more, you can play them across a variety of modern media including computers and hand-held devices, show them across large screens and share them across the internet through private or social media channels. How many families have old cine film stored in a box somewhere? Cine was typically in 9.5mm, 16mm, 8mm and Super 8mm film formats, enjoyed by our forefathers to record home movies. When converting cine films we clean them to create the best possible reproduction. Priceless! We can duplicate CDs, DVDs and USBs as many times as you need, whether they carry audio, visual or a combination of material. We return you waterproof, scratchproof, UV protected, thermal copies, ensuring precious data is secured for the future. Call us without delay on 0800 008 7229 to talk through what you have – and what you’d like it turned in to.